I'm proud to say that this app has been used in an academic paper1 which talks of the "Abbott method". This is because the focus is not on the relatively boring CMC (test the plot with the Linear Concentration option turned on to see what I mean) but what the isotherm (change of surface tension, γ, with concentration) tells us about the surfactant behaviour much, much earlier in the curve when most of the interesting stuff happens. There are two things people know about their surfactant: its critical micelle concentration, CMC, and its surface tension γc at concentrations above the CMC. These have a dramatic effect on foaming properties, along with two other key properties, Γ, the surface "excess" concentration ("excess" is used technically and can safely be ignored) and A the head area. 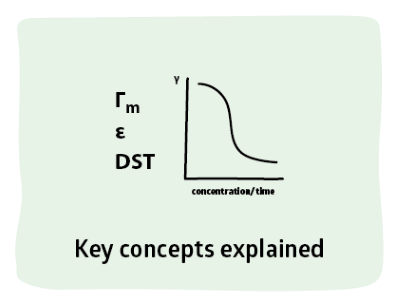 Γ can be found from the slope of the simple measurement of γ v surfactant concentration. That slope tends to be a constant, Γm once γ has decreased by 20mN/m from the starting value of pure water. This allows us to produce a simple view of how the four properties inter-relate using the sliders for the two given properties. Two other properties are described below. The curve is a simplified Langmuir-Szyszkowski plot. Since September 2018 the app has been updated thanks to insights from surfactant expert Sanja Natali. She pointed out that the simplified version tended to give head areas lower than typical values and recommended that Γm should be based not on CMC/10 but on the concentration that gives a surface tension of 52mN/m (which is a key reference state in the equation). You will find that this makes a significant difference. If you don't know what value to use, choose CMC/10 (or CMC/12). If you accidentally set it to greater than CMC/2 (which is implausible) then it is automatically reduced to CMC/10. The theoretical elasticity is often 1-2 orders of magnitude too large. That is because "holes" opened by stretching the interface can be rapidly filled by surfactant molecules from the bulk. The measured elasticity depends, therefore, on the speed of the measurement and the theoretical E is for an infinitely fast measurement. In reality Γm is obtained by fitting the data from a real experiment measuring surface tension v. surfactant concentration. I considered adding a "mixed Γ" option which produces curves for mixtures of primary and secondary surfactants. But I decided against it because outside the academic lab it's probably more work to get the key parameters for the model than it is to measure the curve of your mixtures directly. 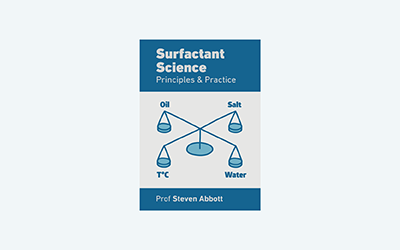 Mixed surfactants are hugely important, but the formulae for describing them don't usually, as far as I can tell, lead to great practical enlightenment. What may seem surprising is that Γm does not depend on CMC but, in this model, only on γc. This is indeed a simplification but Γm does not change strongly between surfactants. What is crucial is how quickly a high Γ value is reached which is governed by the CMC (for a single surfactant) and by partition effects (e.g. when lauric acid is added to an SLES/CAPB foaming system).